This is Peter Anderson's Alacrity "Heron". 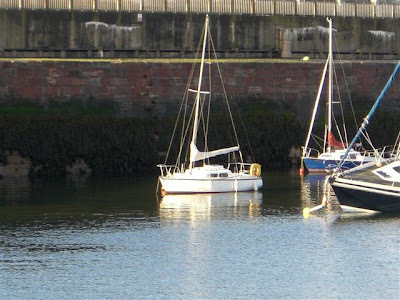 He keeps her in in Dunbar harbour at the mouth of the Firth of Forth in Scotland. 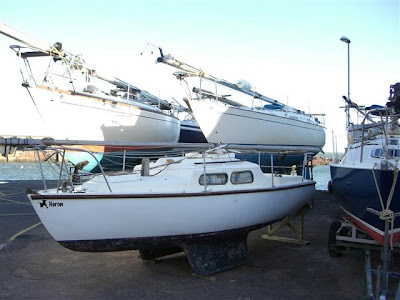 "The boats finally went back into the water on Friday the 18th April and yesterday Sunday 28th I was out for my first solo sail in glorious sunshine and light winds. The boat is named "Heron" and is a later model. Previous owners have modified the interior, removing the locker to form one long berth down the starboard side. Heron was damaged during the summer of 2006 when a much larger boat "sat" on it at low tide. This caused some cracking to the fibreglass cross-member aft the mast tabernacle. This was rebuilt using a substantial stainless steel beam and may be of interest to other owners. I have fitted a mast-head navigation light. This is powered by a 12v "power pack" which is intended for starting cars. It is easily transportable for charging up at home and has a 12v socket for mobile phones, GPS, VHF, lighting etc. Again this may be of interest to others."